This Lavender scented amino acid and coconut oil based shampoo cleanses gently without irritating baby's delicate scalp. 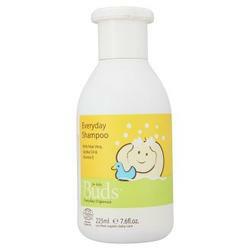 Jojoba and Sunflower oils moisturize and keep baby's hair soft while Aloe Vera extract soothes and hydrates his scalp. Vitamin E will maintain strong. Aqua/water, aloe barbadensis leaf juice*, disodium cocoglucoside tartrate, sodium cocoyl glutamate, coco glucoside, glyceryl oleate, xanthan gum, lavandula angustifolia (lavender) oil*, fructan, tocopherol, helianthus annuus (sunflower) oil, simmondsia chinensis (jojoba) oil*, parfum/perfume, sodium benzoate, potassium sorbate. Use this shampoo once baby has a reasonable amount of hair. Squirt a little into your palm and lather it into baby's hair with a little water. Be careful not to get it into baby's eyes. Encourage baby to tip her head backwards when you rinse the shampoo off.